Read more about this CD here. 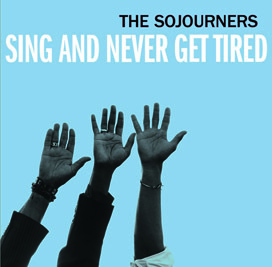 "The Sojourners new album is just plain good listening. But more importantly it shouts for social justice by reinforcing those inseparable links between the early spirituals, gospel, and activist folk music which all arise from hope, faith and courage in the face of adversity. Listen and you shall be released. "- Marc Lindy, Gospel Train, CFRO 100.5 Vancouver. “The much-anticipated eponymous follow-up to their 2007 debut album Hold On ... our boys have recorded a slide-guitar-soaked 11-track Hammond B-3 organ-driven throwback to the old-time jubilation-style gospel vocals of the Blind Boys Of Alabama. By God, this is a great album." “Keep your ear on the prize because “Hold On” is it! Mosely, Sanders and Small really deliver it and Dawson’s band wraps up the package." -Marc Lindy, Gospel Train, CFRO 100.5 Vancouver. "Producer Steve Dawson provides an invigorating musical backdrop featuring his own exceptional guitar skills, along with bass, drums, Wurlitzer and Hammond B-3 organs, and old friend Jesse Zubot on mandolin. The Sojourners confirms music lightning can strike twice in the same place." "These men have an extensive gospel pedigree, singing in church as young men in their hometowns. On this set, though the gospel "feel' is the driving force, there is also a common thread with soul-influenced groups such as Curtis Mayfield and the Impressions. And, the addition of producer Steve Dawson's incredible string work gives this one a decided "Saturday night" edge to go along with the "Sunday morning" influences. That soulful feel is evident in cuts such as "When I Die," and the leadoff "Nobody Can Turn Me Around," with its multi-layered harmonies accentuated by Dawson's slide and B-3 from Mike Kalanj. Will Sanders' upper-register vocals take center stage in tribute to our fallen military heroes, "Another Soldier Gone." Steve's slide again provides the perfect foil to the harmonies in "Great Day," and the socially-conscious "The Neighborhood." Jesse Zubot also adds sweet mandolin on the old-school set-closer, "By And By." We had two favorites, too. Marcus takes the lead on the uplifting story of the "Strange Man at the well" with the power to cleanse your spirit! And, Steve's lap steel adds to the deeply-brooding mix of Rev. Gary Davis' "Death Don't Have No Mercy." Whether you are sinner or saint, you'll definitely feel better after giving a listen to "The Sojourners." — Sheryl and Don Crow, Nashville Blues Society. 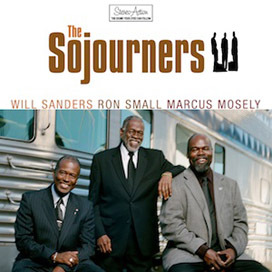 "The Sojourners are Marcus Mosely, Will Sanders and Ron Small. They cut their teeth singing in the church in their respective hometowns of Ralls, Texas; Chicago and Alexandria, Louisiana. They got together a few years ago, when Canadian musician Jim Byrnes asked Mosely to round up some backup singers for a session. This is their second CD for the Canadian Black Hen label, Steve Dawson is once more called on to produce and play guitar, Mike Kalanj plays keyboards, Keith Lowe is on bass and Geoff Hicks plays drums. The Sojourners draw on influences from the gospel, soul, blues, r&b and country traditions, throw them in their own melting pot, and emerge with a unique sound. This music grew on me every time I played it..."
"Several years ago, Canadian blues singer Jim Byrnes needed some backup vocals for a new album. He called his friend, Vancouver-based gospel singer Marcus Mosely, who contacted two of his friends, Will Sanders and Ron Small. When the trio began singing, they knew that they had stumbled onto something special. During the session, Byrnes gave them the name The Soujourners, and an act was born. After the session with Byrnes, they teamed with roots music producer/performer Steve Dawson to make their own recording, and then they made a name for themselves appearing on numerous sessions. Their latest self-titled release, on Black Hen Music, is an excellent showcase for their vocal talents, honed over a combined 150 years of musical experience. Re-enlisting Dawson as producer, the trio is presented in a traditional classic gospel setting, highlighted by Dawson’s stellar blues-based guitar work and Mike Kalanj’s soulful Hammond B-3, and a tight rhythm section (Keith Lowe – bass and Geoff Hicks – drums). Those wonderful group harmonies are the selling point of the disc, however... 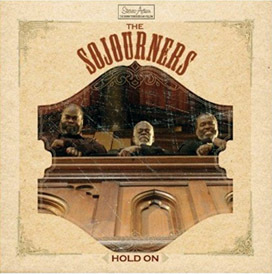 The Sojourners’ vision of gospel music has roots in soul, country, blues, and doo-wop. Whatever your religious leanings may be, you’ll find that there is a lot to love in their music." "The black gents of this trio have been singing for over 50 years but only together for the last few after meeting by accident doing a back up session. It’s a gospel session, but it doesn’t sound like anything you ever heard on Duke or Malaco, it sounds more like the kind of roots session you wish some of the boring farts in the genre would apply their talents to making. If there’s something atavistic about this you can’t put your finger on, it’s this. Remember those movies from the 30s when the movie moguls hadn’t codified the language of film yet and they were trying to be all things to all people? These guys sound like the black singing group that would pop up in a Marx Bros. movie for no reason and do a number to cleanse your palette while the Marx’s set the scene for their next round of shtick. This record is a great find and you’ll probably like it even more if you aren’t a gospel fan since you won’t be bringing a moldy fig sensibility to the proceeding. That, and it sounds like Maria Muldaur/Bonnie Raitt gospel. We dig it and you will too." Back with another album, Vancouver's gospel trio The Sojourners -- Will Sanders, Ron Small and Marcus Mosely -- step into their album with joy, fire and confidence. Those feelings take a strong hold in the lively opener, Nobody Can Turn Me Around, a bass-led, organ-drenched, R&B gospel number featuring a gnarly lead guitar solo from Steve Dawson. Then there's the gritty city funk of The Neighbourhood and a snappy update of the old Motherlode hit When I Die. Yes, The Sojourners step right in with fun and a good beat, praising the Lord and praising the prayer. After all, It's Hard to Stumble (When You're On Your Knees). "Vancouver vocal trio the Sojourners appear regularly with singer-guitarist Jim Byrnes, and here they get their own time and space to perform a rousing set of new and traditional gospel songs. Marcus Mosely, Ron Small and Will Sanders sing sweet harmonies, sometimes alternating the lead voice on each verse of a song. All three gentlemen have been around a while, and their musical influences span generations. Lead Me Guide Me and Nobody Can Turn Me Around both have 1950s elements, the latter using that "bump-bump bump, bump-bump bump" beat so popular 50 years ago. When I Die, on the other hand, sets the way-back machine to the 1970s; both the vocals and the electric instruments belong in something the O'Jays would record. And the guitar-heavy The Neighborhood has the bite of ZZ Top. The backing band shines as brightly as the vocalists. Special mention goes to guitarist, producer and label owner Steve Dawson, who, playing a number of stringed instruments, adds just the right colours to the sound palette." “Grabbing you from the first moment of the soaring title track with pitch-perfect harmonies, Hold On is the righteous 11-track debut of Vancouver-based gospel trio the Sojourners. For 40 minutes, Will Sanders, Ron Small and Marcus Mosely reinforce each other’s deep Southern traditional vocals that shine like church stained glass. Whatever your spiritual inclinations, this is a gem. Produced by Steve Dawson, who also contributes some killer guitar, and accompanied by bassist Keith Lowe and drummer Geoff Hicks. It was recorded in three days and feels wonderfully spontaneous. From ‘Eyes to the Prize’ to ‘Father Along’, it’s soul-stirring stuff. Rating: A. “The Sojourners specialize in close, old-time quartet harmony. Hold On proves they are well schooled in the gospel quartet songbook, as they offer up authentic readings of some of the songbook’s classic compositions. The Sojourners are preserving the jubilee-style of quartet singing that was once the most popular form of gospel music. And doing a marvelous job of it, I must say.” Three out of Four Stars.